Sorry to Bother You is a worthwhile film with something to say and I’m sure it is being dissected and digested by film students in classrooms across the country. How many times have you just sat down to dinner after a long, hard day of work when suddenly the phone rings. While mildly annoying to have to get up and answer it, it becomes even more frustrating when you find yourself trapped at one end of the phone while a telemarketer at the other end tries to sell you something you don't want or need. As you politely attempt to say ‘no thank you', the person keeps talking since their livelihood depends on your agreement to purchase the wares they are hawking. Never has commercialism been more prevalent in this country and this is simply but one example of it made fun of in writer/director Boots Riley's debut – the dark comedy, Sorry To Bother You. Cassius Green (Lakeith Stanfield; Get Out) is a young black man trying to make a living. He and his girlfriend, performance artist Detroit (Tessa Thompson; Creed) live in his uncle's garage but are about to be kicked out because he owes his uncle money. Trying not to sell out to the big conglomerate "Worry Free" but desperate, Cassius, takes a job as a telemarketer earning nothing but commission. At first, he struggles to get a paycheck but after one of the elders there gives him the advice to talk in his "white man's voice", Cassius starts to see some success. As his progress grows the other workers are increasingly disgruntled and decide to protest, including Cassius. Suddenly Cassius becomes promoted to a "power seller" and moves up from the basement cubicles to the swanky offices upstairs. Here Cassius finds himself at odds as he discovers he is working for Worry Free, crossing the picket line full of his friends but making a great deal of money. Of course, it all comes crashing down when Cassius is invited to a corporate party and discovers what Worry Fee has really been doing - creating horsemen out of their workers. These creatures that are more powerful can do more work in less time, allowing for Worry Free to reap more profits from their "slave labor". Yes, you read that right, horsemen. They make their workers take a powder that turns them into these creatures (mainly against their will) so they can be more productive. And Cassius leads the audience through this climb up the corporate ladder in this commentary on corporate greed. Stanfield is sharp as the rather naïve but conscientious symbol of the "little guy" eager to improve his station in life. Thompson is terrific as his anti-establishment girlfriend. Danny Glover (Lethal Weapon) offers a great cameo as the older telemarketer who gives Cassius the advice that changes his life. The rest of the supporting cast offers some excellent performances that movie this plot along with honorable mention to Armie Hammer (Call Me By Your Name) as the owner of Worry Free. The Blu-ray is presented in the standard 1080p video quality with a 2.39:1 aspect ratio. The high definition picture is strong and clean and the colors span the spectrum. The DTS-HD Master Audio 5.1 is crisp and solid without artifacting. The dialog can be heard clearly and the soundtrack fills the speakers, enveloping the viewer. The combo pack includes the Blu-ray disc, DVD disc, and a Digital HD download. It also has only three extras – audio commentary with Boots Riley, Beautiful Clutter with Boots Riley and a gallery. While not plentiful the extras offer some insight into the mind of Riley and what he wanted to say with this film. Sorry to Bother you has some redeeming qualities and fared well with critics when it was originally released but for me, it was too "out there". I feel the message got somewhat lost in the craziness that came across. However, it is a worthwhile film with something to say and I'm sure it is being dissected and digested by film students in classrooms across the country. Download Sorry to Bother You from the iTunes Store in Digial HD. 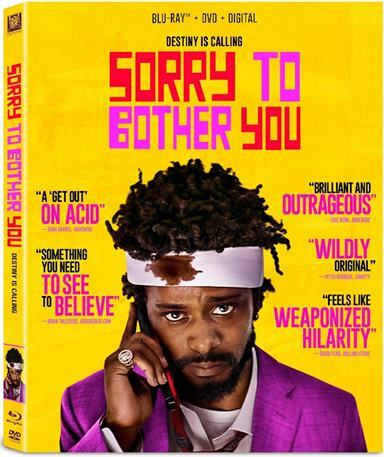 For more information about Sorry to Bother You visit the FlickDirect Movie Database.